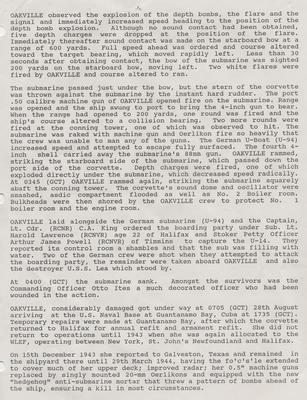 Oakville observed the explosion of the depth bombs, the flare and the signal and immediately increased speed heading to the position of the depth bomb explosion. Although no sound contact had been obtained, five depth charges were dropped at the position of the flare. Immediately thereafter sound contact was made on the starboard bow at a range of 600 yards. Full speed ahead was ordered and course altered toward the target bearing, which moved rapidly left. Less than 30 seconds after obtaining contact, the bow of the submarine was sighted 200 yards on the starboard bow, moving left. Two white flares were fired by Oakville and course altered to ram. The submarine passed just under the bow, but the stern of the corvette was thrown against the submarine by the instant hard rudder. The port .50 caliber machine gun of Oakville opened fire on the submarine. Range was opened and the ship swung to port to bring the 4-inch gun to bear. When the range was opened to 200 yards, one round was fired and the ship's course altered to a collision bearing. Two more rounds were fired at the conning tower, one of which was observed to hit. The submarine was raked with machine gun and Oerlikon fire so heavily that the crew was unable to man any of the guns. The German U-boat (U-94) increased speed and attempted to escape fully surfaced. The fourth 4-inch shell carried away the submarine's 88mm gun. Oakville rammed, striking the starboard side of the submarine, which passed down the port side of the corvette. Depth charges were fired, one which exploded directly under the submarine, which decreased speed radically. At 0345 (GCT) Oakville rammed again, striking the submarine squarely abaft the conning tower. The corvette's sound dome and oscillator were smashed, asdic compartment flooded as well as No. 2 Boiler room. Bulkheads were then shored by the Oakville crew to protect No. 1 boiler room and the engine room. Oakville laid alongside the German submarine (U-94) and the Captain, Lt. Cdr. (RCNR) C.A. King ordered the boarding party under Sub-Lt. Harold Lawrence (RCNVR) age 22 of Halifax and Stoker Petty Officer Arthur James Powell (RCNVR) of Timmins to capture the U-94. They reported its control room a shambles and that the sub was filling with water. Two of the German crew were shot when they attempted to attack the boarding party, the remainder were taken aboard Oakville and also the destroyer U.S.S. Lea which stood by. At 0400 (GCT) the submarine sank. Amongst the survivors was the Commanding Officer Otto Ites a much decorated officer who had been wounded in action. Oakville, considerably damaged got under way at 0705 (GCT) 28th August arriving at the U.S. Naval Base at Guantanamo Bay, Cuba at 1735 (GCT). Temporary repairs were made at Guantanamo Bay, after which the corvette returned to Halifax for annual refit and armament refit. She did not return to operations until 1943 when she was again allocated to the WLEF, operating between New York, St. John's Newfoundland and Halifax. On 15th December 1943 she reported to Galveston, Texas and remained in the shipyard there until 29th march 1944, having the fo'c's'le extended to cover much of her upper deck; improved radar; her 0.5" machine guns replaced by singly mounted 20-mm Oerlikons and equipped with the new "hedgehog" anti-submarine mortar that threw a pattern of bombs ahead of the ship, ensuring a kill in most circumstances.